La Gerusalemme Cucinata: Aaand I'm back: fish with harissa and orange salsa. 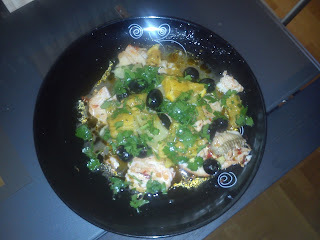 Aaand I'm back: fish with harissa and orange salsa. Re: the harissa, there were 2 potential problems: 1) I have a fairly mild palate and generally go about extremely carefully with harissa considering past experiences, those aren't tastebuds I'll be getting back. 2) My local supermarket, while reasonably well equipped in "ethnic" foodstuffs, didn't carry harissa. I'm sure would have found it easier in a Middle Eastern food store or even a better equipped supermarket, but I just couldn't be bothered. I knew from reason 1) I wouldn't be making massive use of the stuff, so why be particularly "purist" about the stuff? After standing in a hamletic pose for several minutes in the condiment aisle, I settled for sambal. Which is basically a South East Asian equivalent of harissa. I mean, it's a chili paste that's red and spicy, it can't be that different? Another point: the recipe calls for the use of golden beetroot. I have no idea what golden beetroot is (apart from the fact that presumably it's a beetroot and has a golden colour) or where to find it, so, once again I just didn't bother. I've been accused in the past of remaking recipes so that they aren't really the same thing anymore, but I struggle to believ that a beetroot is going to make a world of difference. Maybe once I have more time I'll try again and chase the Golden Beetroot of Wonder. mix a couple of teaspoons of harissa with cumin seeds and a pinch of salt. Smear it on the fish. It really depends on how much fish you have, but I was quite parsimonious with the mixture, because I had no wish to set my mouth on fire. Then put the fish away. Peel and cut into small cubes 2 oranges and half a lemon, mix them with the parsley, olives, cumin and coriander and juice of the other half lemon (I took a picture of the salsa on its own because it just looked so pretty, but my phone ate it, it seems). Cook the fish in a skillet with olive oil for a few minutes, add the salsa. If I can say so myself, this dish was great. The effect of the slight spiciness with the bittersweet flavour of the orange and lemon is fresh and delicious. Definitely something to try again to spice up (indeed) some boring fish, and fairly straightforward and quick to make to boot! I am an Italian citizen of the world, presently based in Southern China, working in a university, in a quaint little town that will be known, if necessary, as Gin Tonic or Ginseng. My profile picture isn't me, but expresses me pretty well.